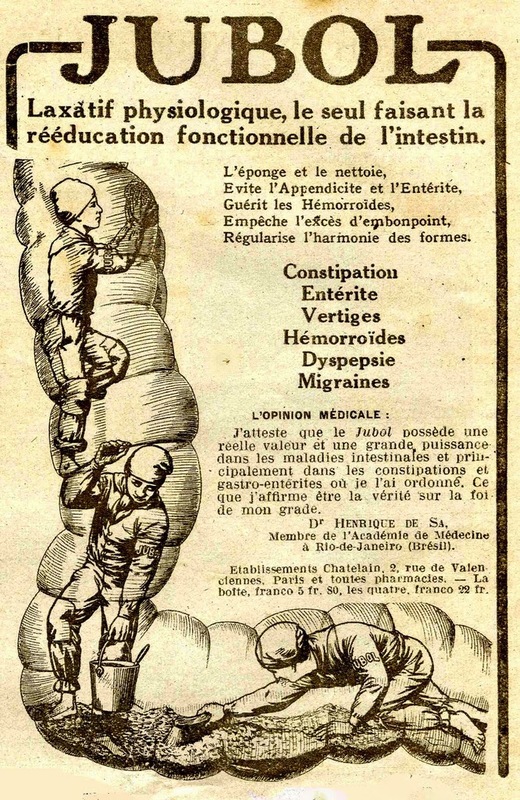 This French ad from 1919, although a little odd, shows just how long constipation has been something of concern. Although it hasn’t gotten much easier to speak about in public, according to the American Society of Colon & Rectal Surgeons approximately 80% of Americans suffer from constipation in their life. Constipation can be the result of insufficient fiber and water in your diet. Lack of exercise also complicates this condition, as does some types of prescription medication. In fact, walking at least thirty minutes a day is as good for colon function as it is protective for your heart. That’s like getting a bonus for putting in the same amount of effort. Moreover, drink at least 6-8 glasses of water a day. Don’t just say you do – measure! Set aside a small pitcher or water container with that exact amount. The colon is actually where a majority of water is absorbed into the body, so if there’s not enough water to begin with things are most likely to get “dry” and ultimately stuck. It may seem like a lot but if you space it over the day it will become routine and natural. Note that sugary sodas and caffeine beverages are not a substitute for the water. Things like soup or smoothies however may be. Change your diet to colon friendly foods. Back in the day when people ate more fresh produce and worked hard in the field or factory, constipation was less of a problem. We eat too much of the wrong kind of foods and get too little of the right kind of exercise. Both of those things need to change if you want to get rid of constipation. Eat more root vegetables and fruits that are high in fiber. That’s a big change from fast foods that tend to be loaded with flour, fat and sugar. You’d probably get more fiber by eating the wrapper than what you get from the fast food itself! Regardless of how the constipation came about – and until you get on the right track for foods and exercise – you need relief now. Herbal remedies may be the best solution. Herbal laxatives work in one of two ways: to either add bulk or stimulate the bowels to eliminate. As with any laxative, don’t overuse or use for too many days at a time. You can become dependent – even on herbal laxatives. Excess laxative use is treating the symptom, not the problem and can cause dehydration, potassium depletion and irritation of the muscles in the colon. Add dried plums or prunes to your diet for their natural ability to promote healthy bowel movement. Black cherry juice may also have the same effect for some people. Dandelion root tea can bring ease to constipation as can eating marshmallows. These have substances that are soothing and lubricating to the colon. Prevention is the best approach for constipation. Use a combination of these suggestions to get your body in better shape and you can throw the over the counter laxatives out with the trash!